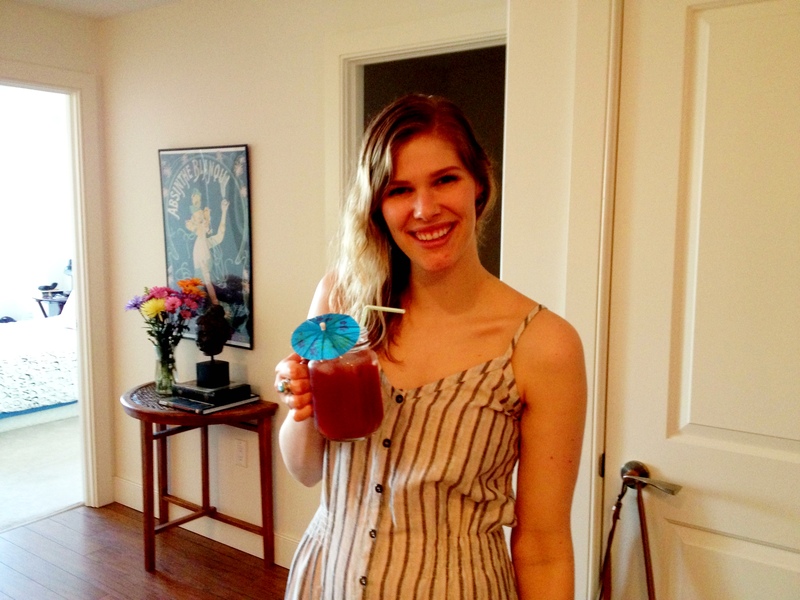 I have been so busy enjoying the summer in the past few weeks that I cannot believe I have yet to post June’s Food & Wine Cover Recipe Challenge recap! Despite the fact that this is a ridiculously late posting, it has to be said that it was a great success. 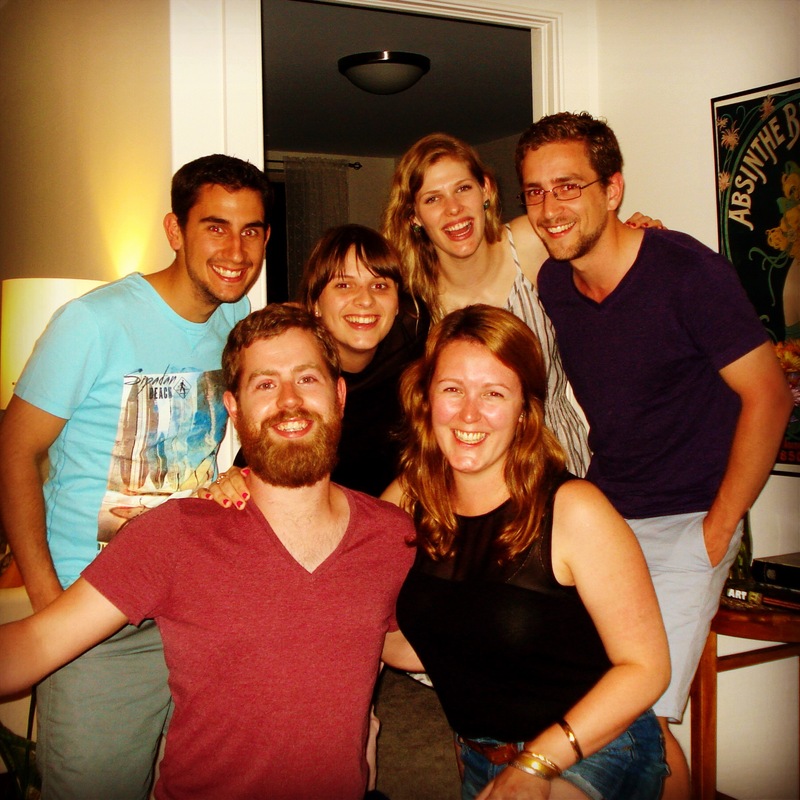 For June’s challenge we were lucky enough to have a few extra hands in the kitchen: Franzi and Evan are great friends, followers of my blog, and have been dying to join in on a challenge and, of course, eat a delicious meal! Similar to last month’s issue, June’s recipes centered around barbecuing, al fresco meal options, and lots of fresh produce and meat. The cover recipe itself was three types of ribs and everyone was excited to get into the kitchen (and onto the patio) to start cooking! 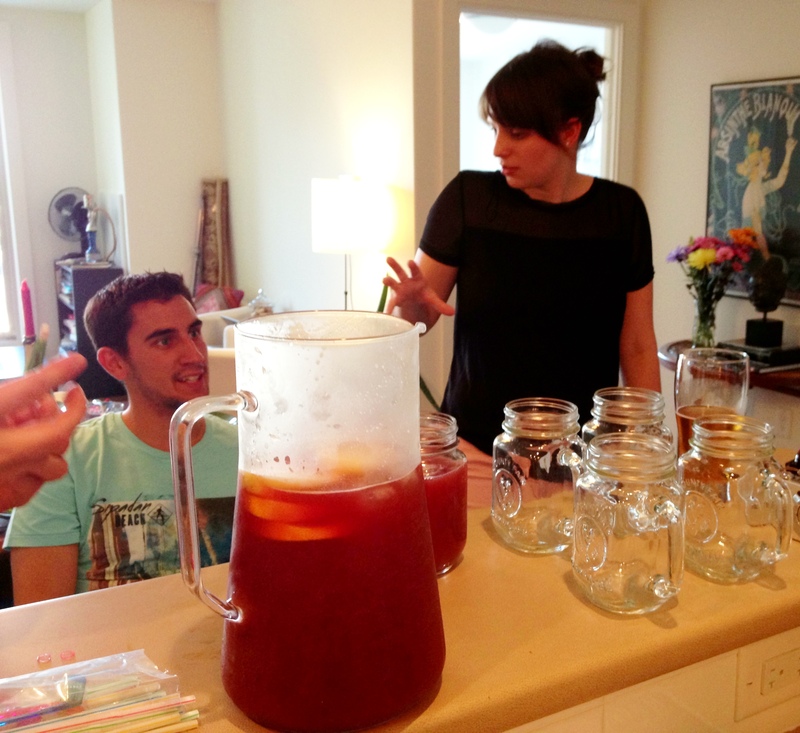 To celebrate the sixth month in a row for the recipe challenges (YAY) I wanted to make sangria. 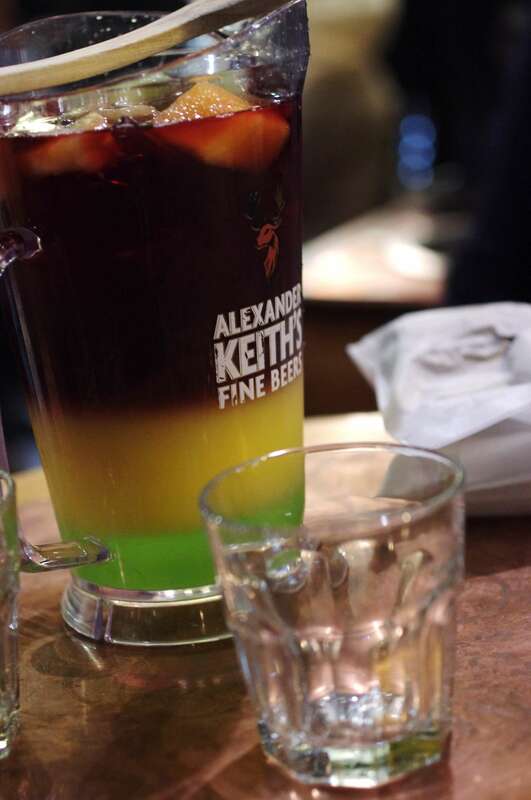 While living in Toronto during grad school, I discovered a place on Bloor Street that makes the most amazing, delicious sangria in the world. I know, a bold statement to make, but seriously, Future Bakery & Cafe makes the best sangria; it is so good, and see for yourself, it looks magnificent!!! So to start off the evening with a great drink, I tried to recreate this delicious imbibe, meticulously studying the volumes of the different spirits that make up the layered sangria as described to me by the Future bartenders many drunken times over. It was a disaster. None of the liquors stayed separated and it ended up looking rather brown in colour, kind of like mouldy wine. Thankfully it tasted great, which is the most important thing, and we got the cooking started after a few libations. 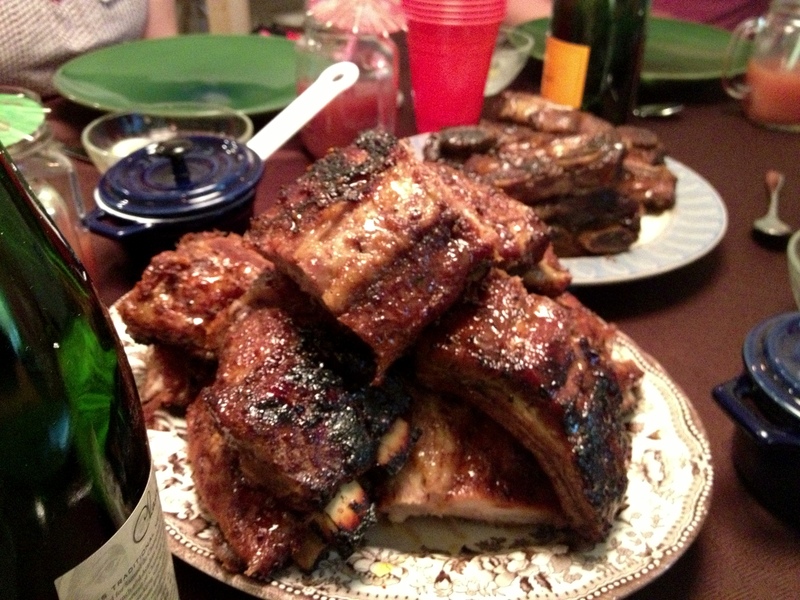 The menu for the evening (like always) revolved around the cover recipe which was three types of Ribs with Hot-Pepper-Jelly-Glaze. To start off, we prepared the Honey-Buttered Grilled Corn and the dirty mashed potatoes (my own concoction) that would accompany the ribs. 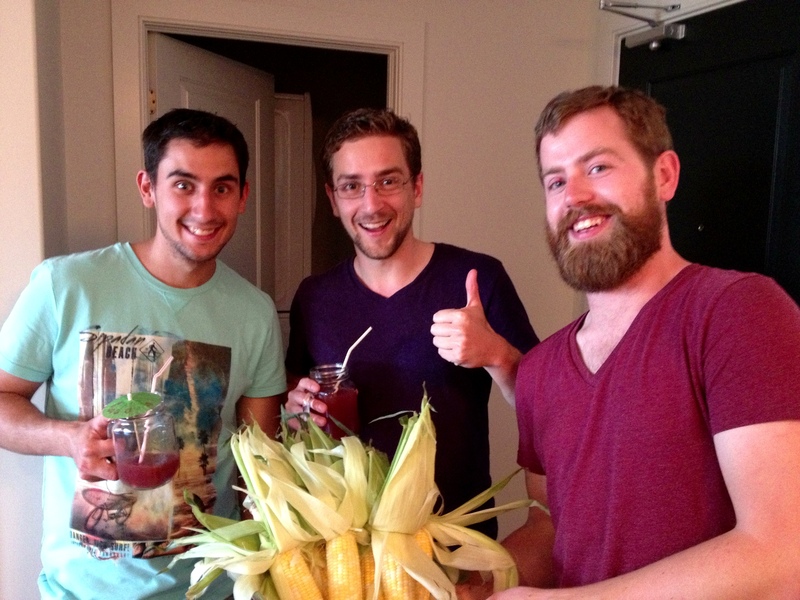 The corn was actually very easy to prepare although it had a lot of steps involved. First of all, we had to shuck the ears of corn without pulling the husks off all together which is trickier than it sounds. I left this task up to the boys as they were eager to help. See how proud they look after completing their task. After shucking the corn, the next step was to spread a mixture of honey and butter on the ears and sprinkle with cayenne pepper and kosher salt, which Erin and I did. Then we pressed a sprig of oregano onto the corn, wrapped the ears back up in the husks and tied with a kitchen string. We didn’t have kitchen string (something I always seem to need to but never have), but some random elastic bands that I had around the house did the trick. 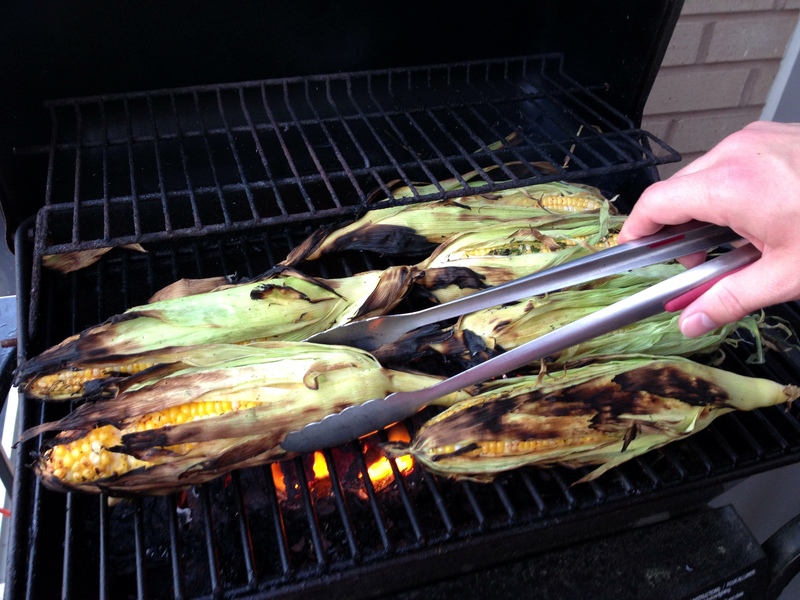 Then I passed the buck to Adam and put him in charge of grilling the corn along with the ribs on the BBQ. 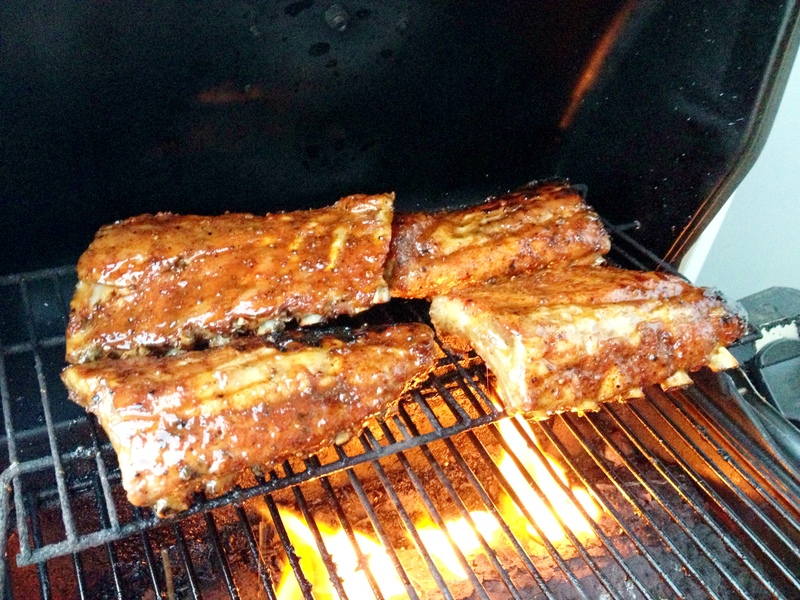 The ribs themselves were also fairly easy to prepare. I marinated them over night in the most delicious spicy marinade that consisted of crushed coriander seeds, orange peel, brown sugar, and a trio of chili, garlic, and onion powders. The day of the challenge I made a sauce with red pepper jelly, white miso, Sriracha, and lemon juice that was used to baste the ribs on the grill and to be served at the table for extra dipping. It smelled freaking amazing. Adam and I did have some trouble getting the three types of ribs that were required for the recipe (short, spare, and baby) and in the end only used short and baby back ribs, although I don’t think the recipe suffered at all because of this. I want those babyback, babyback, babyback ribs! For the appetizer this month, I chose to go off book with a fresh watermelon salad that wasn’t in the magazine simply because I freaking love watermelon. 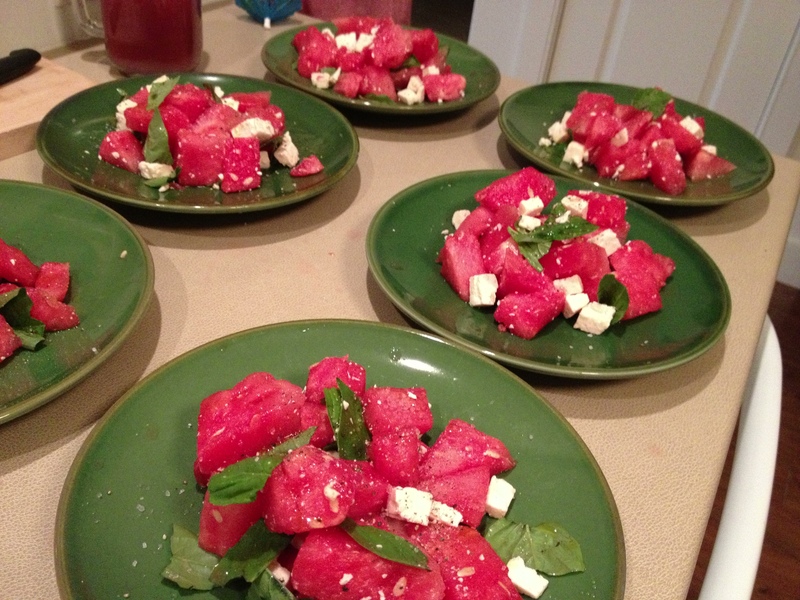 I chose Chef Michael Smith’s Watermelon Basil Feta Salad (find the recipe here) and prepared it right before the meal was ready so the ingredients didn’t get soggy. 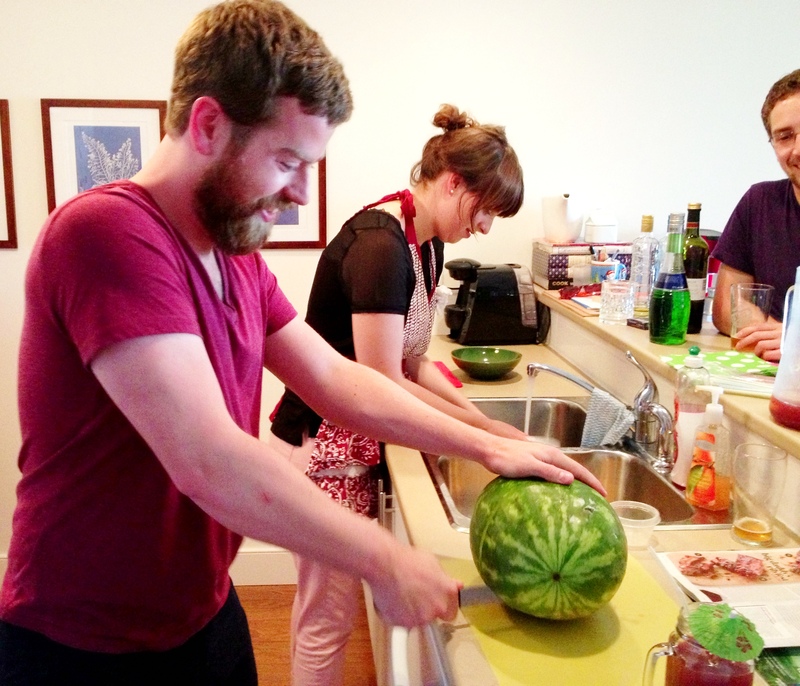 Franzi was an awesome sous-chef in the kitchen as she diced the feta and Adam used his manly arms to slice the watermelon. And finally, we were ready to eat. The watermelon salad was a HUGE success. Everyone loved the fresh and summery flavour and it disappeared off people’s plates in minutes. The best part of this salad beside the taste was how easy it was to make. Anyone can make this salad and it looks super impressive once it’s plated. The kosher salt really gives it a punch and the watermelon was so juicy, YUM! The ribs, corn, and dirty mashed potatoes followed and were also enjoyed by all. The corn was super flavourful and the cayenne pepper added a great kick to the otherwise dull vegetable. We had extra honey-butter on the table too, which no one could get enough of! June’s cover recipe got a rating of 3 out of 5 not because the recipes were hard to follow, but because the ribes tasted just okay. The sauce on the ribs made them very moist and the red-pepper-jelly gave it a great kick making the flavour striking, but definitely not cover worthy in my opinion. The corn on the other hand was great! It was fun to prepare and fun to eat. 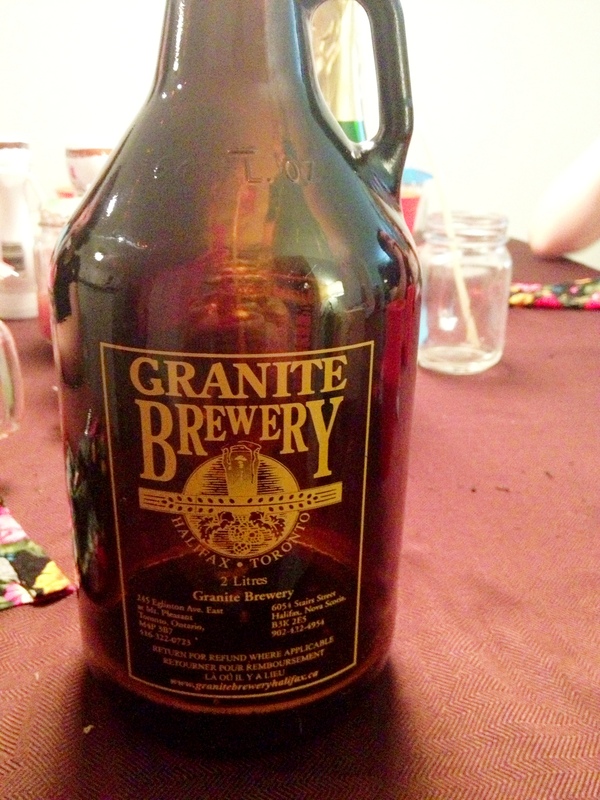 Franzi and Evan were gracious enough to bring not one, but two growlers of local beer from Granite Brewery to pair with the main course. They chose Keefe’s Irish Stout to pair with the ribs and its robust flavour went well with the spicy ribs and corn. The second beer was Greenman Organic, a pale ale that was super refreshing on that hot evening because it got hot in our little kitchen! For dessert, Adam made his patisserie debut with Caramel Brownies. 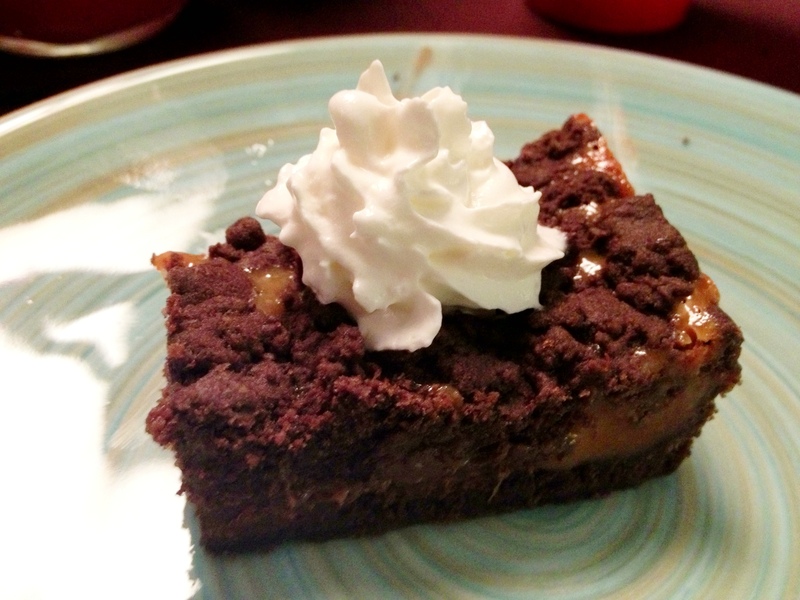 He prepared them the morning before the recipe challenge as they required multiple visits to the oven and he wanted to make sure that he got the layering of the brownie and caramel right. The brownies were delicious! Adam’s first attempt at baking was a success: they were super oooey gooey and with the crispy brownie dough made the perfect dessert on a warm evening. You can find the recipe for the brownies here on allrecipes.com. 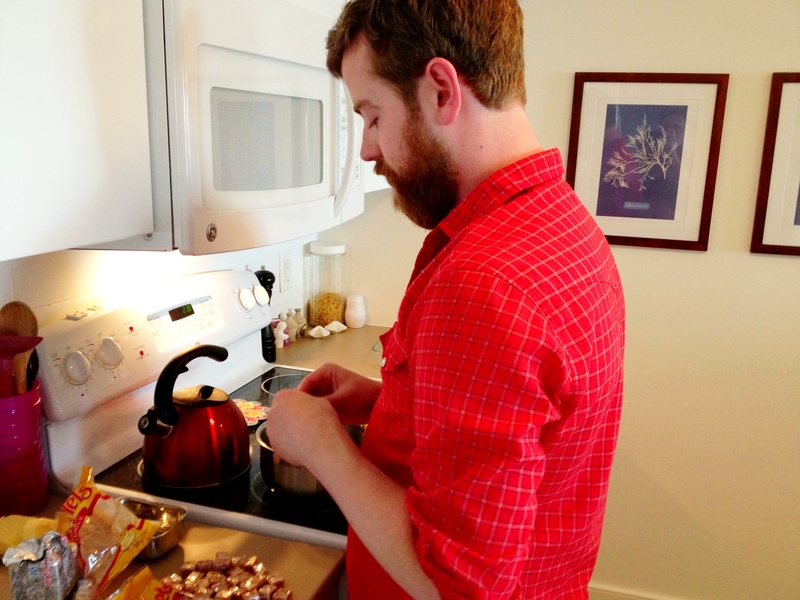 It is a simple and easy recipe, great for a novice baker like Adam. Overall the dinner was a huge success. 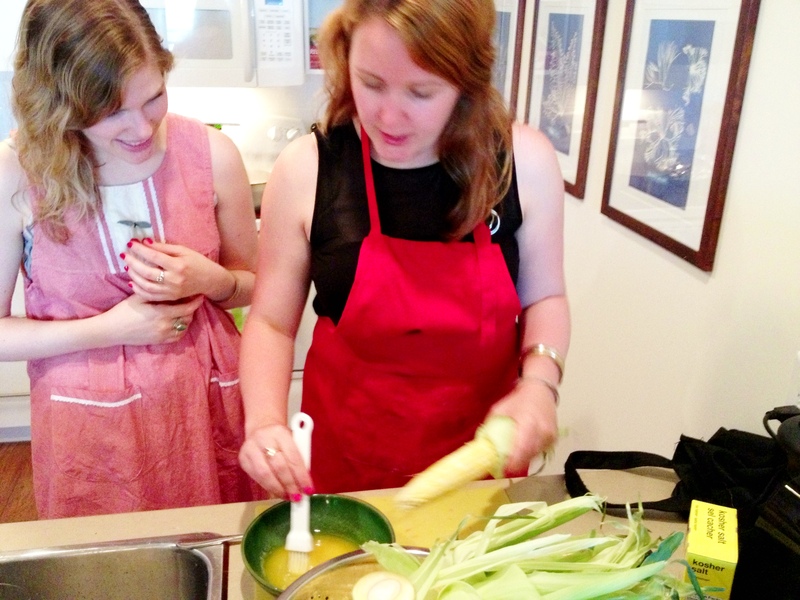 It was a little more hectic cooking with six people who were all eager to help, but it was lots more fun too! I had a great evening trying out the new recipes and it was a great way to celebrate the halfway point of the Food & Wine Cover Recipe Challenge! I cannot wait to Explore.Eat.Repeat the next six months, Bon Appetit!